There’s nothing better than having a barbecue on a hot summer’s day and inviting friends and family over to enjoy it too. However, this can be a hazardous time for our furry friends and can result in burns, tummy upsets and even digestive damage, meaning an emergency trip to the vets! Given how mouth-watering the smell of a barbecue is to us, it’s even more tempting for our furry friends. Just the smell of sizzling sausages and burgers can have even the most well-behaved pooch hurdling over fences and risking paws and whiskers, in the hope of snaffling a sausage or guzzling down a burger. Even if you’re just popping indoors to collect a marinade or make a salad, make sure all your pets are safely kept indoors and are never left alone with the barbecue. Place it up high and away from your eager furry friend’s nose and tongue. If your dog ingests hot food straight from the barbeque, it could cause serious damage to their stomach and digestive tract. These fatty foods are delicious and tasty for us but can be too rich for our pets. If fed to your furry friend, they can induce a nasty tummy upset or more serious digestive inflammation. These include onions, garlic, corn-on-the-cob and cooked bones. So, make sure that these are all kept away from your pet during preparation and cooking. Ensure that your family and friends are aware and know not to feed these to your pets too. Barbecue skewers will be laden with tasty morsels and juices, which are irresistible to our canine companions. Sadly, many won’t just stop at licking them but will often ingest the skewer itself, which can be a choking hazard and cause serious damage to their digestive tract, including perforations. This can be very tempting for your furry friends to lick, as it’s laden with mouth-watering juices. However, it could lead to nasty burns to their tongues and paws – ouch! So always make sure you remove it after you have finished cooking and place it somewhere safe out of your pet’s reach. Dispose of any used skewers, cooked bones, fatty left-overs or meat wrappers in a secure pet-proof bin, as these can be harmful to your pet. If you have a charcoal barbecue, make sure it’s extinguished properly after cooking and gas barbecues should be securely switched off. Any lids or hood should be closed to help prevent your pet accessing the hot charcoals, or any feline friends jumping onto hot grills. 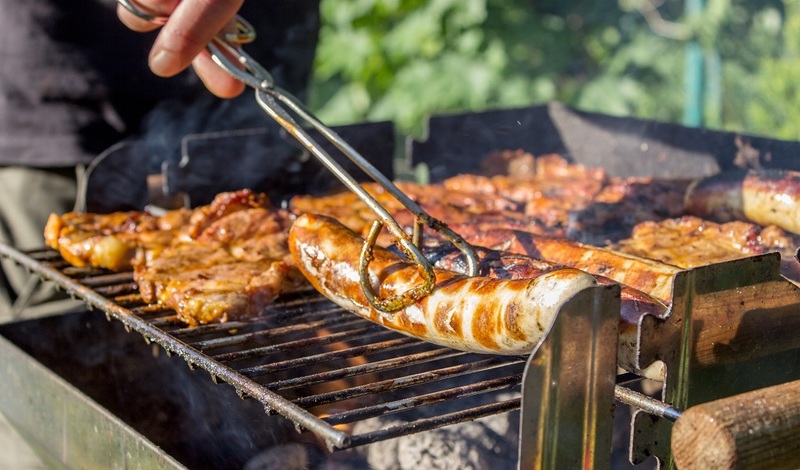 Even if you aren’t planning on having your own barbecue during the summer, parks and beaches can become dotted with people carrying portable grills, which can be difficult to spot until it’s too late. So, take extra care when planning your dog walk and make sure you keep them on the lead if you are going to be walking in a barbecue hot-spot. ©2018 Merial Animal Health Ltd. All rights reserved. Merial is now part of the Boehringer Ingelheim Group of Companies. Date of preparation: Jun 2018. PE2595.